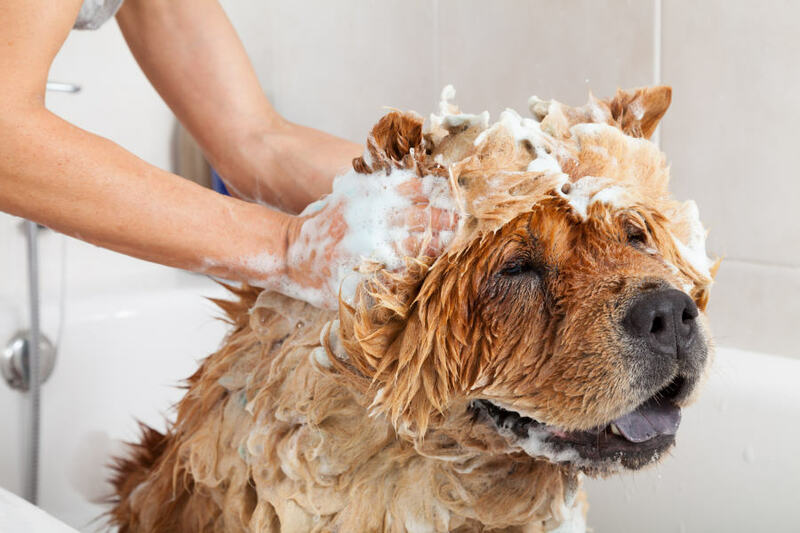 The 7 Best Dog Shampoo In 2019 - helloBARK! Owning a dog can sometimes be a challenging and messy experience. Our precious pups have a knack for finding a puddle to splash around in or play in mud with their canine pals at the park. They may even roll around in something particularly disgusting which can omit an undesirable odor from their hair. It can feel like you’re doing housework all day if you’ve got a dog that’s constantly shedding. Little hairballs build up on the stairs or you’ll find a collection of fluff under the sofa. Giving your dog a regular bath can help to get rid of bacteria, dirt, fleas and ticks. Some dog shampoos can even help to tackle the persistent shedding. If your dog has dry or red skin, a dog shampoo can work as a moisturizer to soothe sore patches. • Why Should You Use Dog Shampoos? • Why Should You Bath Your Dog? • How Often Does Your Dog Need A Bathe? • What Happens If You Bathe Your Dog Too Often? • What Happens if You Don’t Bathe Your Dog Enough? Why Should You Use Dog Shampoos? You may be tempted to use human shampoo rather than go to the effort of purchasing dog shampoo. However, using human shampoo is putting your precious pooch at risk because it can contain harsh detergents that can damage a dog’s coat and irritate their skin. Dog shampoo usually contains oils that won’t antagonise a dog’s skin but can still wash out dirt that has accumulated in a canine’s coat during the day-to-day adventures. 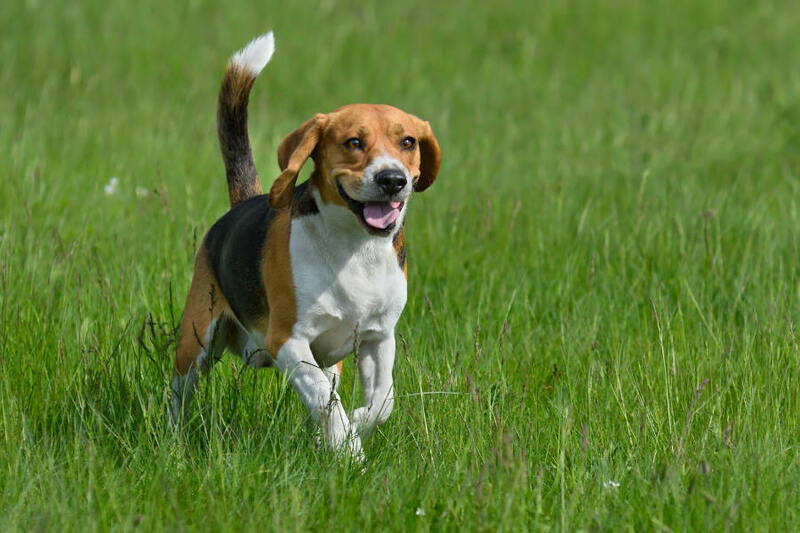 Using specifically designed shampoo products for dogs can help to kill fleas and ticks that may have latched onto your pup’s coat during long hikes or trips to the dog park. Just like humans, dogs could suffer from an allergy to certain fragrances. Some pet parents will know that their dog has an allergy or sensitive skin, so will select a hypoallergenic dog shampoo. 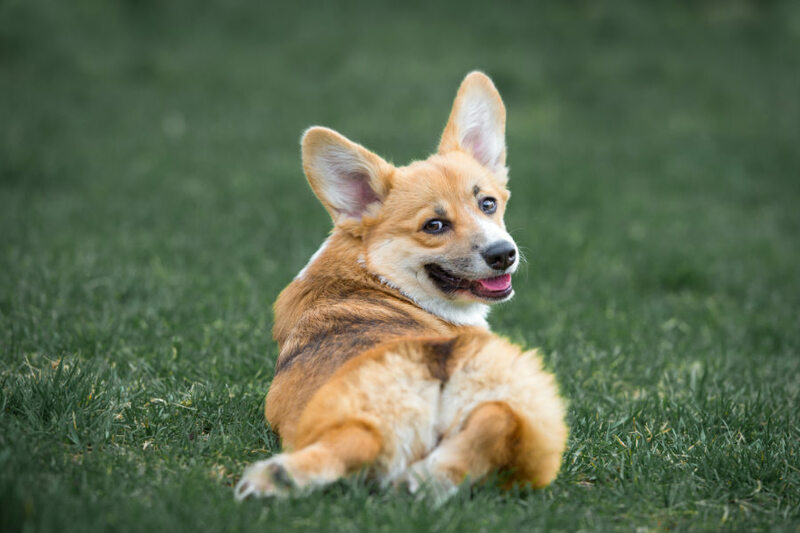 There are other dog shampoos that can tackle a specific issue such as getting rid of an unpleasant odor if your pup has rolled in something smelly at the park or found a rodent in the back garden. Some breeds will require a specific type of dog shampoo. Why Should You Bathe Your Dog? The Kennel Club have bathing guidelines on their website for dog owners. Bathing your dog from time to time is important to maintain “basic hygiene and grooming standards”. Their website adds that regularly bathing your dogs can help to avoid health and skin issues such as fungal and bacterial problems. Best For Hypoallergenic If your dog is prone to skin allergies, you’ll want to make sure you’re using a hypoallergenic shampoo to avoid irritating their skin. 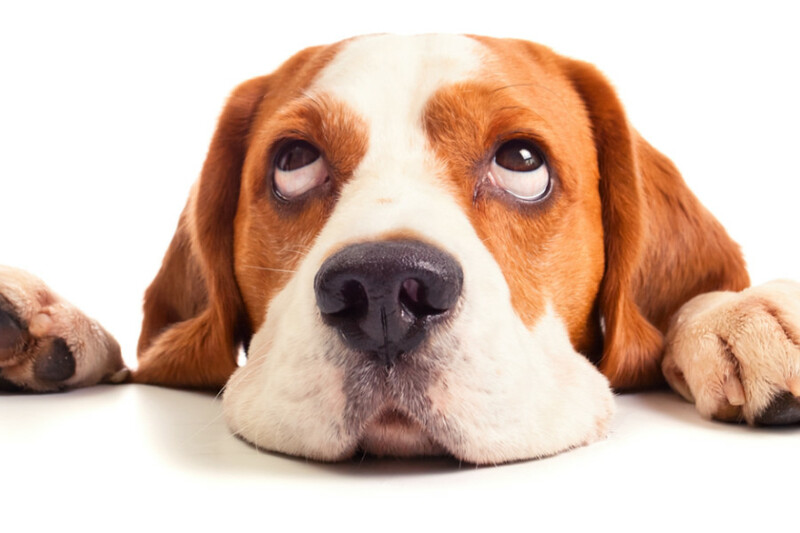 Shampoos that contain harsh chemicals or additives can really aggravate a dog’s allergies. Fortunately, there are an array of options for those looking to use a shampoo for dogs with sensitive skin. These hypoallergenic shampoos are formulated specifically for dogs with allergies. 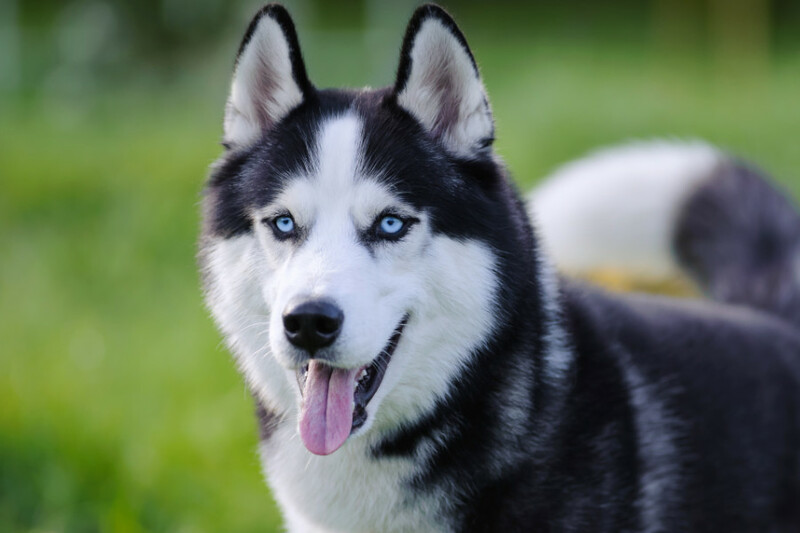 Best For Shedders Dog owners with pups that shed a lot will be tearing their own hair out with the amount of fur accumulating in random spots around the home. 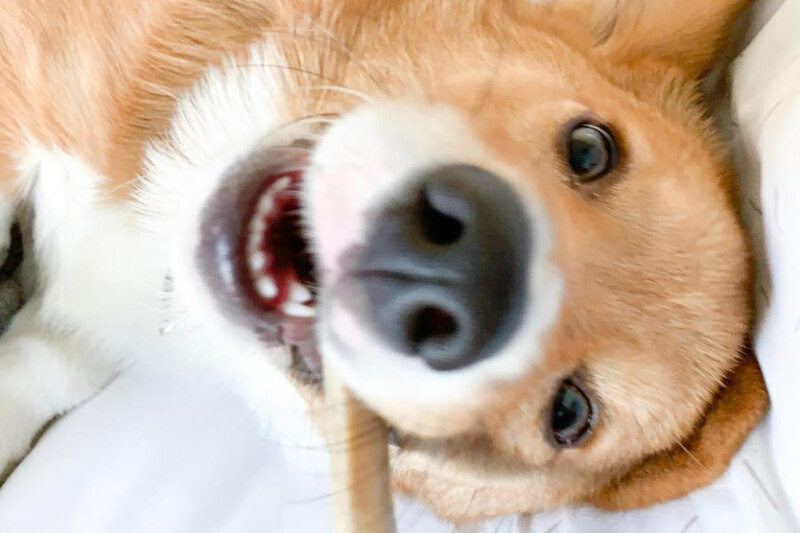 However, there are some specifically formulated shampoos that can be used to help frustrated dog owners tackle what may seem like a never-ending issue. These shampoos will work to reduce the shedding, which will come as welcome relief to some pet parents. Best For Dry Skin Should your dog be suffering from a bout of dry and flaky skin, you may prefer to use an all natural product to help soothe any irritation. Shampoos designed to address dry skin will also need to wash out any flakes caught in your dog’s coat. Best For Fleas No-one like fleas. Finding fleas on your dog or being told by the vet that your dog has an infestation in its fur can be upsetting. 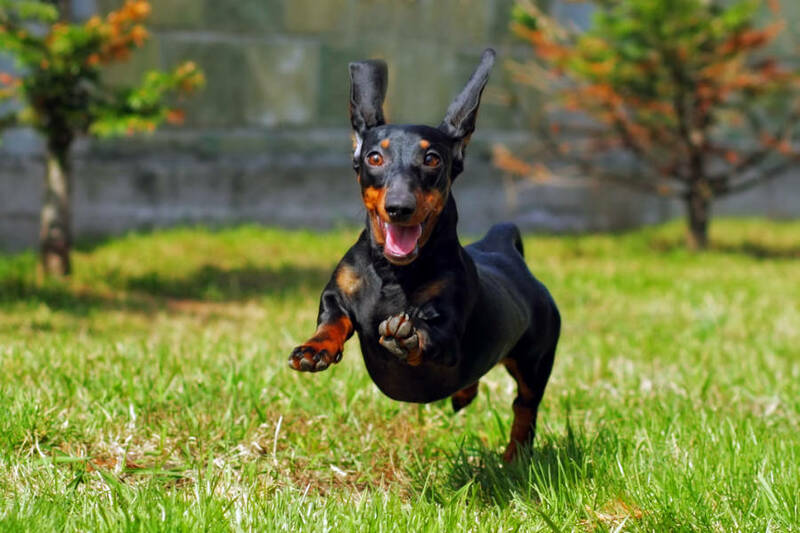 Your vet will recommend monthly medication to prevent against these little creatures but there are flea and tick shampoos that can be used in conjunction with this to effectively tackle the issue. They’ll offer your dog protection for a set period, too. Best Organic Shampoo There’s nothing worse than getting home from a trip to the park, only to discover that your dog has rolled in something nasty and smells like a skunk. Fortunately, there are some organic shampoos that work to get rid of stubborn odors. If you want to sure you’re using 100 per cent organic products, there are lots of options for you. Best For Puppies You’re not short for choice on shampoos for puppies. You want to make sure you use the right product so as not to strip their natural oils in the coat and skin. Given you’re probably unaware of any allergies that your pup may have at such an early stage, shampoos for young dogs use gentle ingredients for potentially sensitive skin. Best For Smell From a selfish point of view, you’ll want to select a dog shampoo that smells good. Given there’s a good chance your pup will be all over your furniture or perhaps sat on your lap, you want them to smell good. However, a pleasant scent shouldn’t come at the expense of your dog’s well being. Pro Pet Works is specially formulated for pets with allergies to food, grass and flea bites. It is non-toxic and non-alcoholic with no animal by products. The shampoo’s organic aloe vera and almonds oil is therapeutic and soothing for your pets skin and coat, while it can keep your precious pooch smelling fresh. They use a special formulation with mixtures of organic aloe extracts, almond oil and vitamins A, D & E that won’t irritate your dog’s eyes, nose or skin while bathing. Acting as a shampoo and conditioner, Pro Pet Works promise you’ll be left with a soft coat that will be easy to brush, leaving your looking feeling and smelling clean. 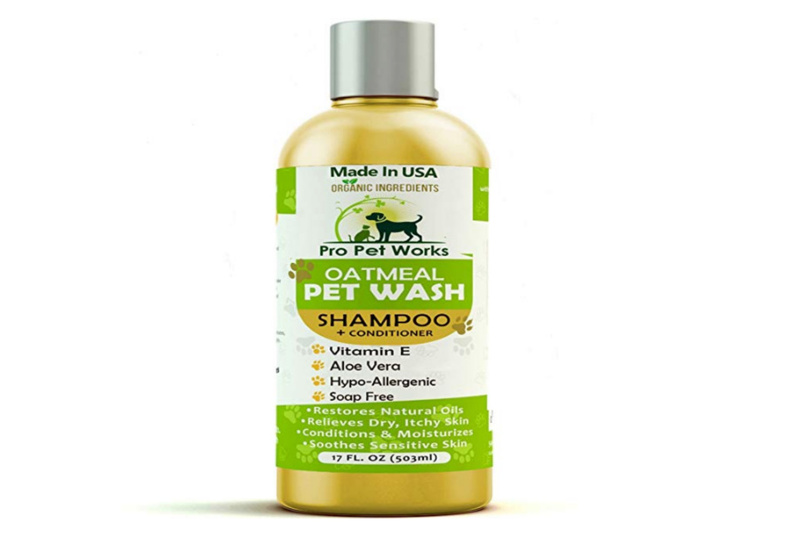 Pro Pet Works All Natural Oatmeal Dog Shampoo is $14.73 for a 17 ounce/503 milliliter bottle. The shampoo has an outstanding rating on Amazon, with 4.6 out of 5 stars based upon over 1,500 reviews. Pro Pet Works All Natural Oatmeal Dog Shampoo and Conditioner is a great option for those with dogs who are hypoallergenic or have slightly sensitive skin. Doubling up as a shampoo and conditioner, the product works to clean your dog, leave it smelling fresh with a soft coat. 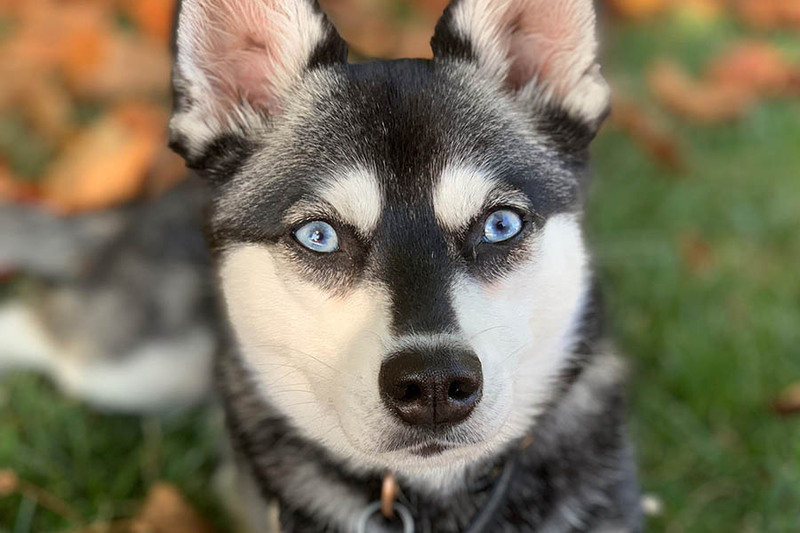 It doesn’t use any added colors, sulfates, alcohol, and fragrance, so you won’t have to worry about exposing your dog to any harmful chemicals. FURminator deShedding Ultra Premium Dog Shampoo is designed to help reduce the rate of shedding. While it’s primary function is to slow down the shedding, FURminator’s shampoo still helps to achieve a healthy skin and coat. This deshedding shampoo is enriched with Omega 3 and 6 Fatty Acids, Calendula Extract and Papaya Leaf Extract. FURminator recommend using the product as part of your grooming regiment. 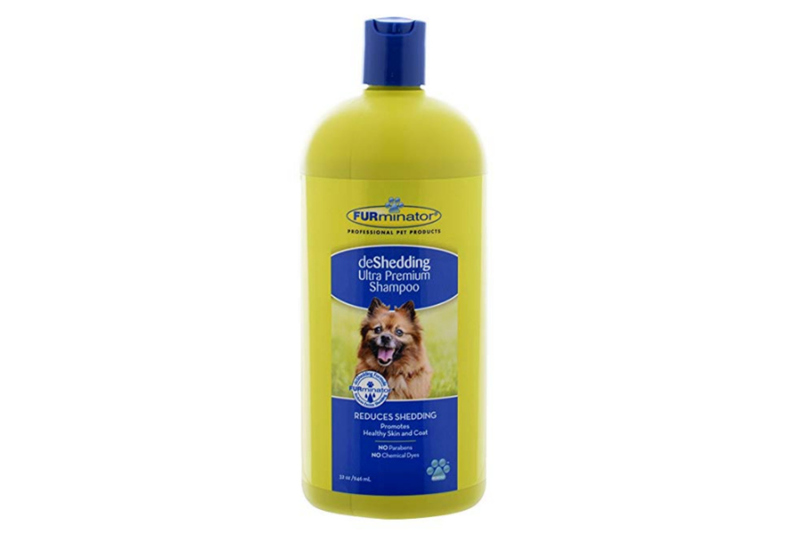 FURminator deShedding Ultra Premium Dog Shampoo costs $21.45 for a 32 ounce / 909 milliliter bottle. The product has a very respectable score of 4.3 out of 5 stars based upon over 1,000 reviews on Amazon.com. If you’re being driven crazy by little piles of fur collecting in corner around the home, it could be worth giving FURminator deShedding Ultra Premium Dog Shampoo a try. Judging by the glowing reviews, the product does help some dogs to reduce the amount of shedding after a bath. While it helps to combat against dead and loose hair, the Omega Fatty Acids can help to moisturize and prevent dry skin. 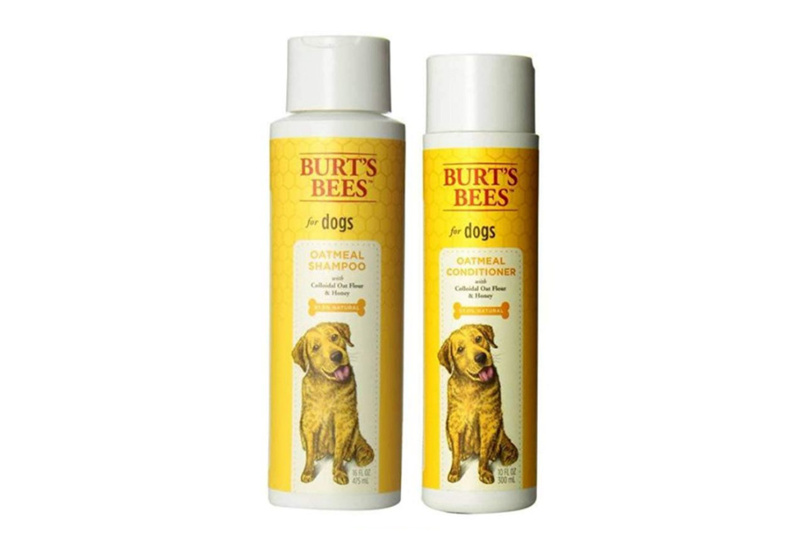 Burt’s Bees For Dogs is a shampoo and conditioner bundle designed to help dog owners tackle the issue of dry skin. With colloidal oatmeal to moisturize dry skin and honey to give fur a super shine, the shampoo is free from any harmful products. You won’t find any sulfates and colorants as Burt’s Bees For Dogs is a 97 per cent natural product made “cruelty-free”. They use a pH balanced formula specific for dogs to prevent over drying their skin which can led to redness or flakiness. Burt’s Bess For Dogs shampoo and conditioner is priced at $17.97 on Amazon.com. The combo pack has an average rating of 4.4 out of 5 stars based upon nearly 30 reviews on Amazon.com. If your dog is prone to dry skin, flakiness or redness, Burt’s For Bees can help to soothe any irritation. Using colloidal oat flour to prevent against eczema and honey to moisturize dry skin, it can also be used as a preventative measure. Offering both a shampoo and conditioner in the bundle represent good value for money. It can be a challenging time when your dog has fleas or ticks. Adams Flea and Tick Cleansing Shampoo can be used in conjunction with medication supplied by your vet to tackle the problem. This product can kill fleas, flea eggs, Brown Dog ticks, American Dog ticks, and lice. It works by breaking the life cycle of fleas and ticks. The cleansing shampoo will continue to work for up to three or four weeks to protect your pooch against fleas, ticks and mosquitos. 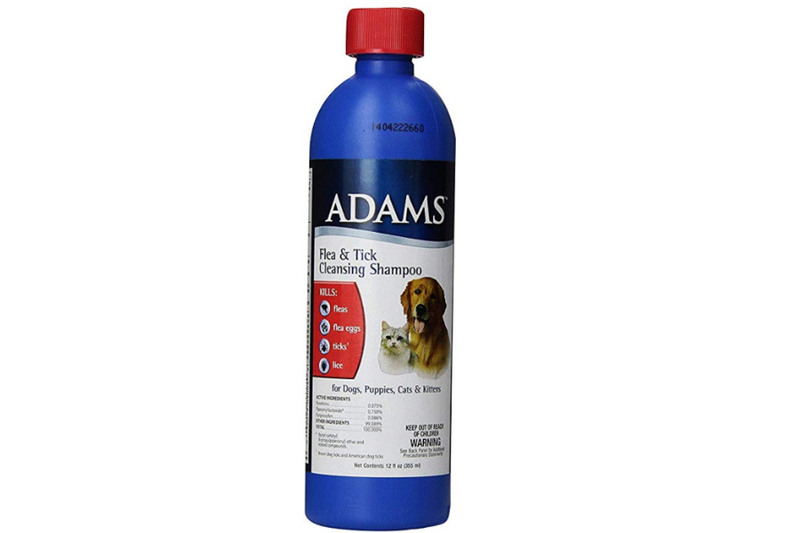 This Adams Flea and Tick product costs $10.68 for a 12 ounce / 355 millilitre bottle on Amazon.com. The shampoo has an average rating of 4 out of 5 stars based upon over 250 reviews on Amazon.com. If you’re looking for a product to kill fleas, flea eggs, ticks and lice, Adams Flea and Tick product could be the right shampoo for you. While it gets rid of unwanted passengers on your dog’s coat and skin, it has a pleasant smell and can leave your dog’s hair with a shiny appearance. It can also protect from flea infestation for 30 days and breaks the flea life cycle. 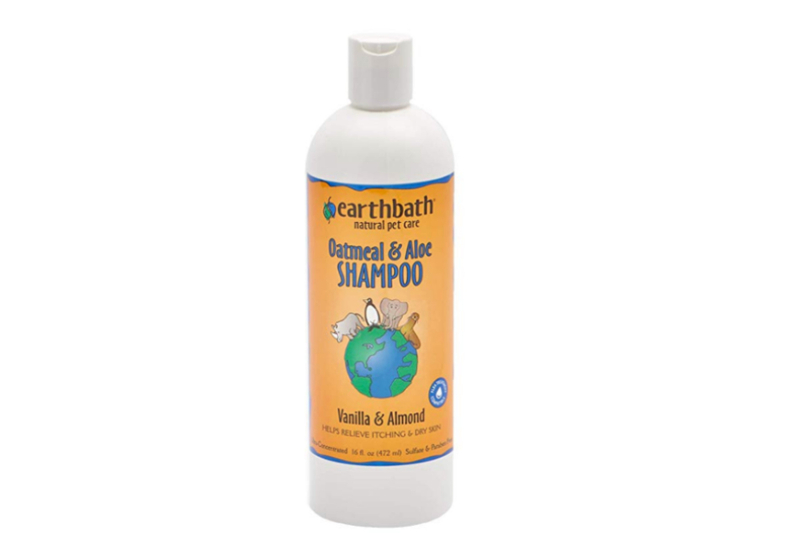 Earthbath All Natural Pet Shampoo is a 100 per cent natural shampoo. It’s specially formulated with oatmeal and aloe itch relief shampoo to address the needs of pets with dry, itchy skin. Oatmeal (3%) and organic aloe Vera combat skin irritation, promote healing, and re-moisturize sensitive, dry skin. The shampoo is natural, soap free and pH-balanced to clean and deodorize safely, which should leave your dog’s coat and skin clean, soft and smelling better than before. Earthbath All Natural Pet Shampoo is priced at around $15.46 for a 16 ounce / 471 ml bottle on Amazon.com. Alternatively, you can purchase a gallon bottle for $55.15. This natural product has an average rating of 4.3 out of 5 stars on Amazon.com. Looking for a product that is 100 per cent organic but as effective as other dog shampoos? Well Earthbath All Natural Pet Shampoo is a solution that is popular with pet parents on Amazon. Considering the price, the product seems to represent excellent value for money. Alpha Dog Series Puppy Shampoo and Conditioner is pH balanced so dog owners don’t need to worry about the puppy’s skin drying out or becoming irritated. Shampoo and conditioner is combined into one and is fortified using Aloe Vera as well as natural fruit and plant extracts. 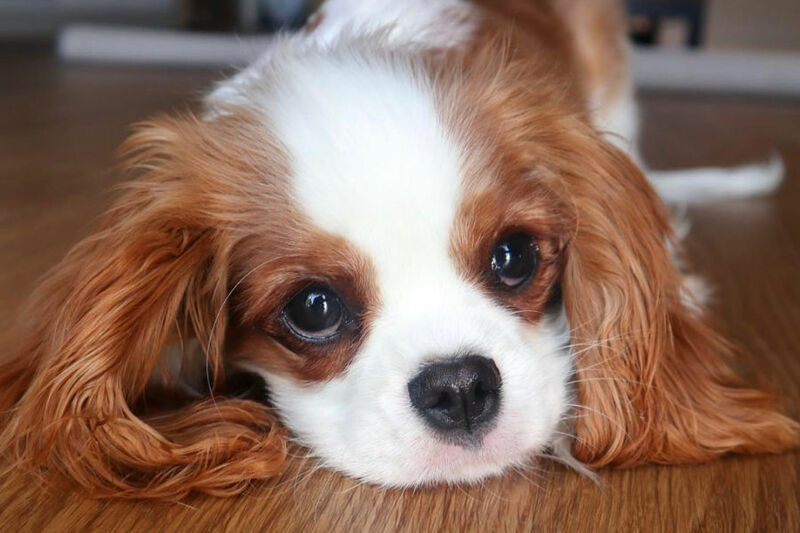 They use a tearless shampoo so your puppy’s eyes won’t be irritated during their first experiences of bath time. Alpha claim that the long lasting clean fragrance will last up to two weeks. Alpha Dog Series Puppy Shampoo & Conditioner costs $15.99 for a 26.4 ounce / 750 ml bottle on Amazon.com. If you really like this product, you can buy a pack of six for $64.99. This shampoo and condition combo has an average rating of 4.9 out of 5 based upon 120 reviews on Amazon.com. Alpha Dog Series Puppy Shampoo & Conditioner has glowing reviews on Amazon.com to suggest the product is enriching the lives of puppies – and older dogs. Great for pooches with sensitive skin, dry skin, dandruff, or any skin ailments. If you’re dog has rolled in something that is particularly smelly, you’ll want to get rid of the odor as quickly as possible. Some products such as Pro-Sense Oatmeal Shampoo are designed to get rid of stubborn smells on your dog’s coat. 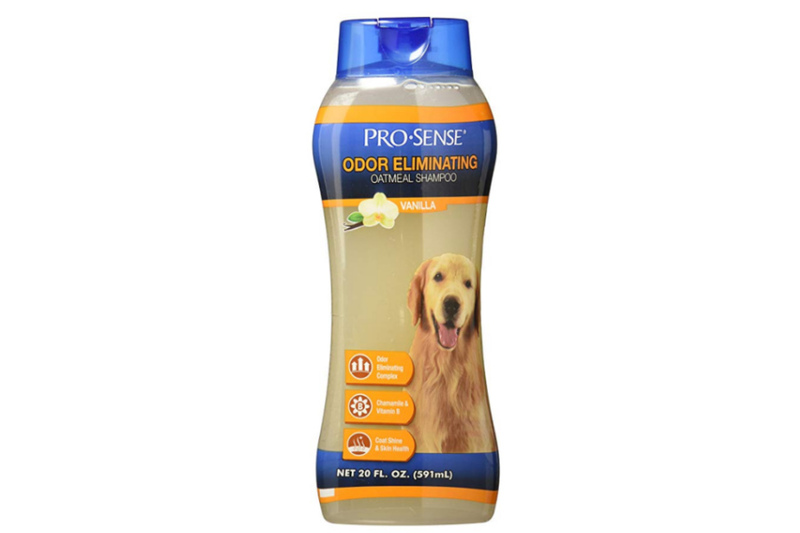 It uses a dog odor eliminating shampoo formula to minimize your pet’s smell with a lasting vanilla scent. Pro-sense explain that the natural oatmeal and microencapsulated liposomes can calm itchy, dry and irritated skin. Pro-Sense Oatmeal Shampoo is priced at $14.52 for a 20 fl oz bottle on Amazon.com. This vanilla scented shampoo has an average rating of 4 out of 5 stars based upon nearly 200 reviews on Amazon.com. If you’re looking to combat some stubborn odors and smells, Pro-Sense Oatmeal Shampoo could be the product for you. While it’s vanilla scent works to give your dog a pleasant-smelling coat, it helps to leave their hair clean and tangle free. It’s a reasonably priced product within the shampoo range. Like we mentioned above, making sure your dog dries off completely is very important. For dogs with a double coat or thick fur, there is a risk that damp fur can be a breeding ground for fungal infection. Snuggly Dog Easy Wear Dog Towel is made with 400gsm microfiber material for a superior water absorbent dog towel that dries your dog’s coat off quickly. With a soft belt to wrap around their underbelly, your dog can stay comfy and warm after bath time until completely dry. Snuggly Dog Easy Wear Dog Towel costs $39.99 on Amazon.com. The drying robe has an average rating of 4.3 based upon 5 stars on Amazon.com. We understand the importance of keeping your dog dry and warm after a bath. It can be a stressful experience for any dog or pup, so preventing shivering and damp inner coats is important. Judging by the reviews on Amazon, the Snuggly Dog Easy Wear Dog Towel does just that! How Often Does Your Dog Need A Bath? It’s generally recommended that you bathe your dog at least once every three months. You may find some hygiene conscious pet parents will bathe their dog once a month or even once a week if they’re using a gentle shampoo that doesn’t dry out their dog’s skin or affect their coat in a negative way. The frequency of the baths can depend on what type of breed that you have. For instance, Yorkshire Terriers who have a coat that is floor length will require a bath every week or so. 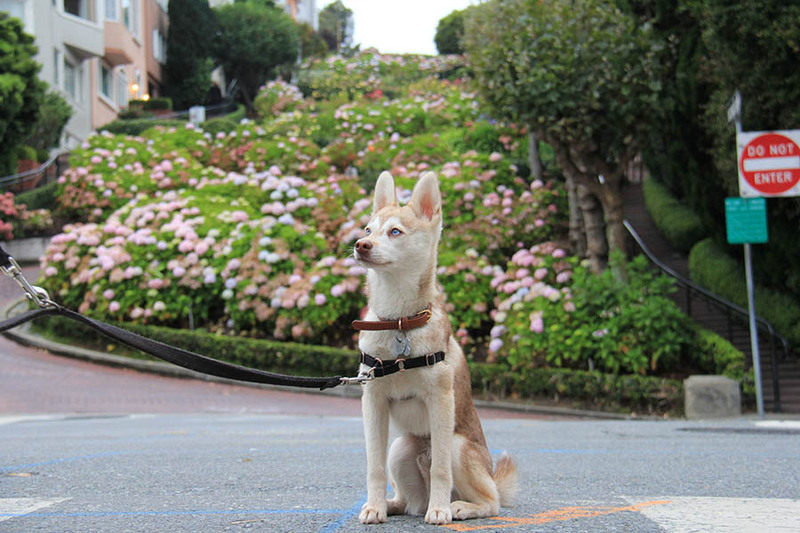 Alaskan Klee Kai owners will only need to go through the bath time experience around every three months. Dogs that have long hair that collects debris and dirt are more likely to require a regular bath than pups with short, coarse fur. 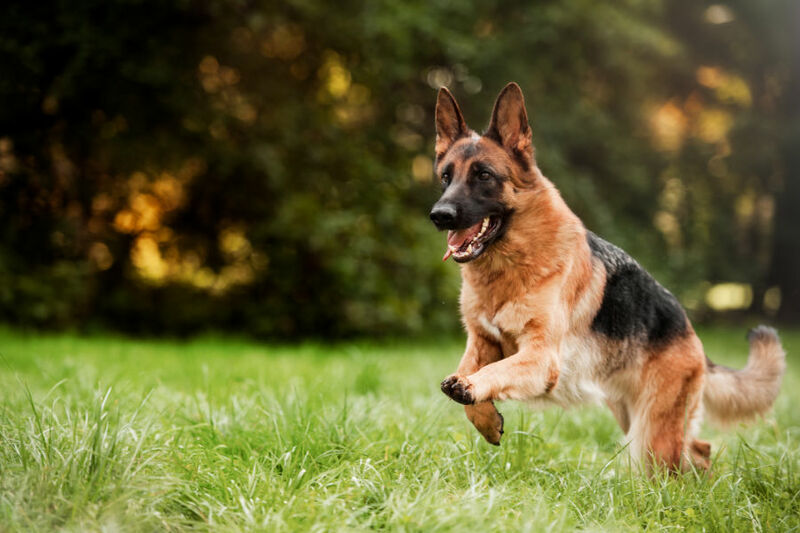 The type of activity that your dog engages in is another factor. If you bring your pooch on lots of hikes in the mud or in the long grass, you may want to bath your dog after the expedition. But if your canine spends most of the time in an apartment apart from a brief walk along the sidewalk, weekly baths won’t be necessary. The Kennel Club suggest factors such as breed, size, fur thickness and length of fur, lifestyle factors, activity levels and types of activity will determine how often your dog needs a bath. They add that using your common sense and nose are often the best indicators. What Happens If You Bathe Your Dog Too Often? While bathing your dog is important to protect against potential health problems and eradicate an bad smells, you don’t want to wash your dog too often. If you do, it can be detrimental to their hair and skin. Too many baths can strips away vital skin oils, resulting in dry or irritated skin. Dogs that are bathed too much could end up with brittle and coarse hair that loses it’s natural shine and vigour. 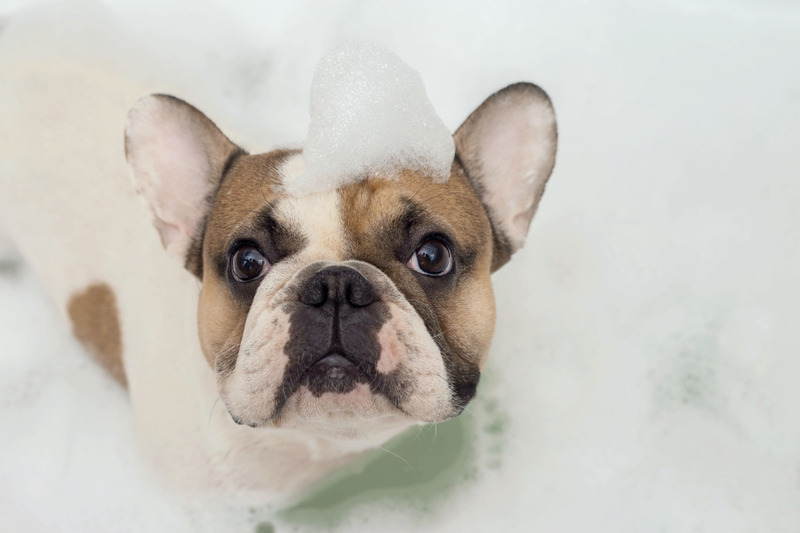 Should you have questions about the ideal bathing schedule for your pup, we recommend speaking to your local vet or an experienced groomer who can give you more information. What Happens if You Don’t Bathe Your Dog Enough? By not bathing your dogs at all, pet parents are also putting their precious pooches at risk of contracting bacterial or fungal diseases. Dog’s skin is very different to human skin – our four-legged friends can absorb allergens, bacteria, dirt and fungus through their skin, rather than breathing. That’s why it’s important to regularly bathe your pups. Dog owners who opt against bathing their canines are putting them at risk from suffering some nasty skin conditions, such as lesions. While selecting the right dog shampoo and finding the right balance in terms of frequency of baths is important, it’s also vital that you properly dry your pooch once splash time is over. For dogs with a double coat or thick fur, it’s essential that their pet parents are able to dry them as effectively and quickly as possible. Obviously you don’t want your dog or pup to suffer from the chills given the inner coat can remain damp, but you want to avoid creating a moist breeding ground for bacteria and fungal infections. 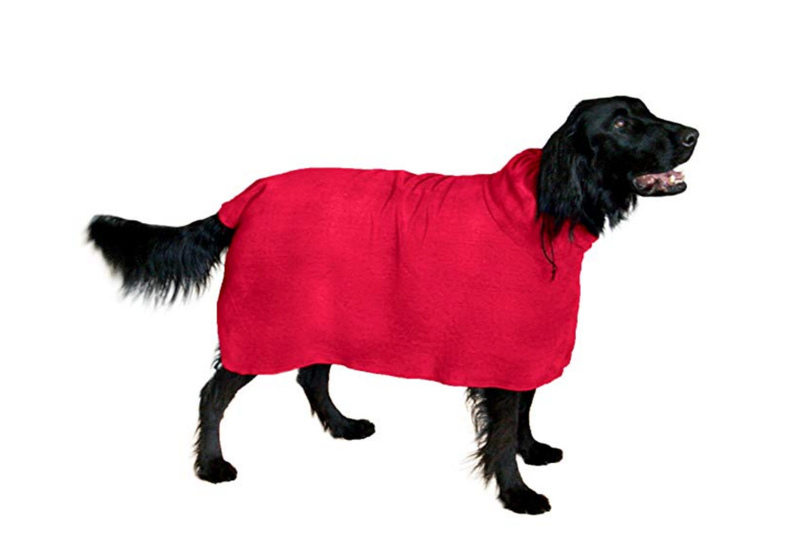 Therefore, it’s essential you’ve got a blanket, robe or towel that will quickly dry your dog’s coat to avoid any unwanted complications and to make bathing time as pleasant as possible for your dog. Human shampoo can be dangerous for dogs with harmful detergents in these products – but experts don’t advise using baby shampoo either. Unlike humans, baby shampoo isn’t a safe alternative for dogs as it can dry out a dog’s coat. Using a blow dryer at home isn’t advisable if you’re unsure what you’re doing or don’t have a lot of experience using one to dry a pet. The Kennel Club warn on their website that blow dryers can result in pet parents inadvertently burning their dog’s skin. Where blow dryers are concerned, you’re best bet may be turning to an experienced dog groomer. Dogs will occasionally require baths to maintain their good health and grooming standards. Regularly bathing your dogs can help to protect against bacterial and fungal problems that may otherwise develop. If your dog has come back from a walk or a jog particularly dirty, you’ll need to give them a wash too. It’s important to understand what type of dog shampoo can help to protect and tackle certain problems. There are hypoallergenic shampoos for dogs with sensitive skin, while some products can help to prevent fleas and ticks. Such is the variety available to dog owners, there should be an option for everyone!